The Model 5410EOL / 5411EOL End-of-Line Module is a device which augments automatic testing of 100 Volt constant voltage speaker lines. 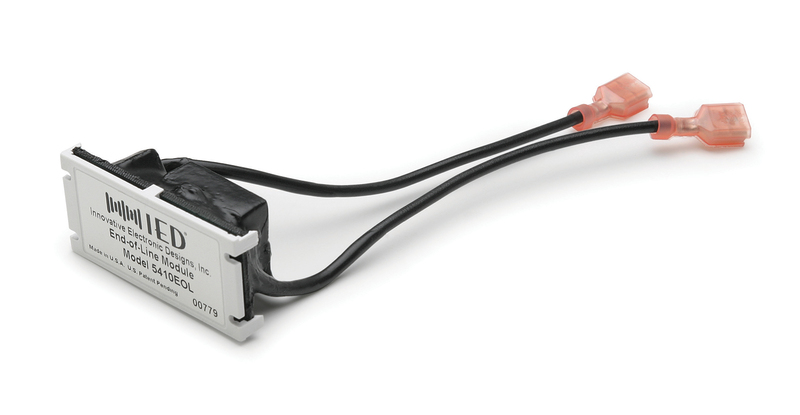 The 5410EOL / 5411EOL allows testing continuity of speaker wiring all the way to the end of the line without the need and expense of a return wire from the line end. When used with the automated test function of the 5404DZM or 5432DZM, the 5410EOL / 5411EOL enables testing the integrity of the speaker lines. While the 5410EOL / 5411EOL represents a significant load to the amplifier and speaker lines at 20 kHz, it has no significant effect on the audible frequency performance of the system. For proper / complete speaker line testing, speakers on a circuit must be wired as one continuous string without any paralleled off branches. 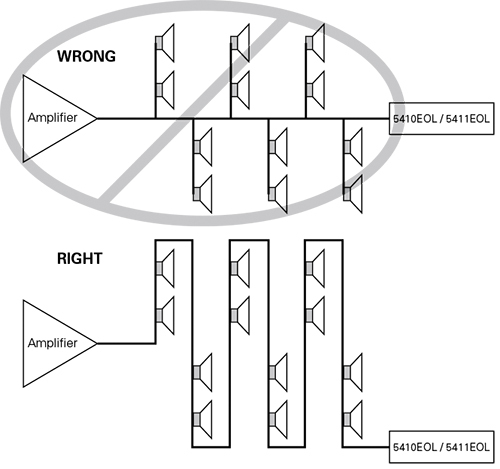 The figure below shows the right and wrong ways to interconnect speakers for proper testing. Only one 5410EOL / 5411EOL can be applied to the end of the speaker line of any one DZM speaker output. It is not permissible to place additional units in branch circuits of the same speaker output.